LONGWOOD, Fla. -- Nine-time major-championship-winner Gary Player has designed more than 300 golf courses around the world. One of his first designs was Alaqua Country Club in Longwood, Fla., 15 miles north of downtown Orlando. Water hugs the green on 18 at Alaqua Country Club. Player spent countless hours on the site creating a layout that took full advantage of its adjacent location to the lush Wekiva Preserve State Park and the Little Wekiva River. 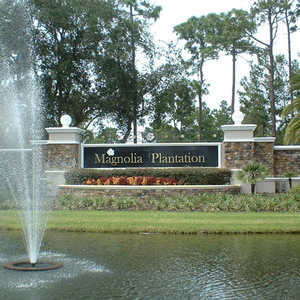 Opened in 1988 just off Markham Woods Road, the golf course is the centerpiece amenity of a master-planned, private, gated community brimming with large, luxury estate homes. Sculpted through tunnels of soaring 60-foot trees and incorporating water in some form on 16 of the 18 holes, the course is short by today's standards at 6,395 yards from the back tees. A phenomenal shot maker throughout his long and illustrious career, Player designed Alaqua to encourage a variety of shots from different angles. Large, mature oak trees draped with Spanish moss and tall palm trees are prevalent and provide an inviting habitat for wildlife. On a typical round, you'll have occasional sightings of deer, wild turkey and alligators. Alaqua recently debuted new practice facilities with a well maintained putting green, chipping area and teeing area with 20 hitting stations. "The fairways are narrow, and there's water on most of the holes, so you've got to formulate a solid strategy on every hole," Alaqua Head Professional Austin Hughes said. "While the greens are small, they're relatively flat, so you're rewarded for good club selection and well-executed approach shots." Player's design philosophy is to provide multiple tee positions and angles and create strategic bunkering particularly around the greens that demands consistent shot making to score well. Hughes said that despite the tight fairways and water hazards, the pace of play at Alaqua Country Club is amazingly quick. "You can easily play a round in four hours or under, even on the weekends," said Hughes. "We get lots of players who come here because they love the pace of play." The most talked about hole at Alaqua Country Club is the 177-yard (159-yards gold tees, 144-yards blue tees and 110-yards red tees), par-3 No. 13, one of Central Florida's most beautiful holes. The tee boxes are situated on a series of mounds creating a daunting shot. Surrounded by water, the smallish green is fronted by a long bunker that's a magnet for under-clubbed shots. Along the left side, impressive mansions that look like Parade of Homes nominees frame the lake. 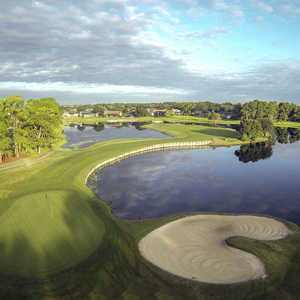 One of the Orlando area's best stretches of picturesque and challenging holes is 13-18 at Alaqua Country Club. "You get the full effect of the Wekiva Preserve on these holes," Hughes said. Your round concludes with a short par 4 that measures 350 yards from the back tees (335-yards gold tees, 310-yards blue tees and 249-yards red tees). The approach shot is a knee knocker to a small green fronted on the left by a rock bulkhead and on the right by a bunker. The lavish, richly appointed clubhouse is home to the pro shop and the Restaurant at Alaqua, which is open to the public and offers a buffet from 11 a.m. to 3 p.m. on Saturday and a daily lunch menu from 11 a.m. to 3 p.m. Dinner is served from 5:30 p.m. to 8:30 p.m. on Wednesday, Friday and Saturday. For lunch, popular selections include the Blackened Shrimp Quesadilla, Pulled Pork Flatbread and Pastrami Reuben. You can dine inside or outside on the patio. If you want to enjoy dinner after a round, the menu is dotted with specialties such as Jerk Chicken Pasta, Grilled New York Strip Steak and Spanish Paella. "Alaqua is a great private club experience where guests feel very welcome and accommodated," said Hughes. 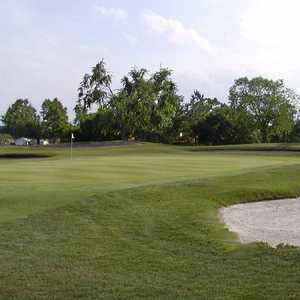 "Golfers enjoy nature, and our course combines scenic wooded areas with great golf holes." If you're looking for a well designed, strategic layout that doesn't demand mammoth tee shots with fabulous tree growth, elevation changes, beautiful landscaping and picturesque lakes, Alaqua Country Club is an excellent choice. Better still, you'll love the rapid pace of play that'll make your golf experience even more enjoyable.